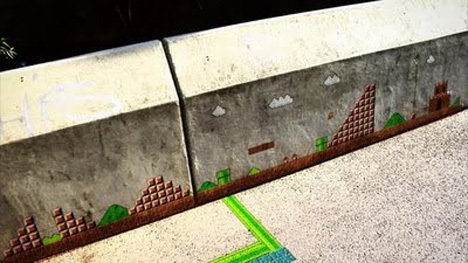 If you really needed a reminder that technology is awesome, German compositor Andreas Heikaus put together this awesome video in which he seems to play an entire game of Super Mario Bros. on a graffiti-tagged wall. The effect is, of course, a composite of gameplay animation and live-action video footage. It’s a seamless combination that comes out looking like the next generation of street art: playable animated graffiti. If you’re interested in just how Heikaus pulled off this very cool project, he has put together an informative video giving insight into the process. Heikaus produced the video as part of his bachelor’s thesis at the University of Applied science and art in Hannover, Germany – and we hope his grade reflected how awesome the finished product is.